The 60’’ Round Dining Set protective furniture covering by PCI is made with the PCI Dura-Gard HD Vinyl. The Dura-Gard vinyl uses exclusive polypropylene backing, which goes through an extensive process in which it is first compressed into a flat sheet of material and then laminated directly onto the vinyl fronting. This ensures that the fleece won’t come off on furniture and breakdown like traditional fuzzy backed vinyl covers do. The strength created by the vinyl and propylene combination is unmatched by competitors. 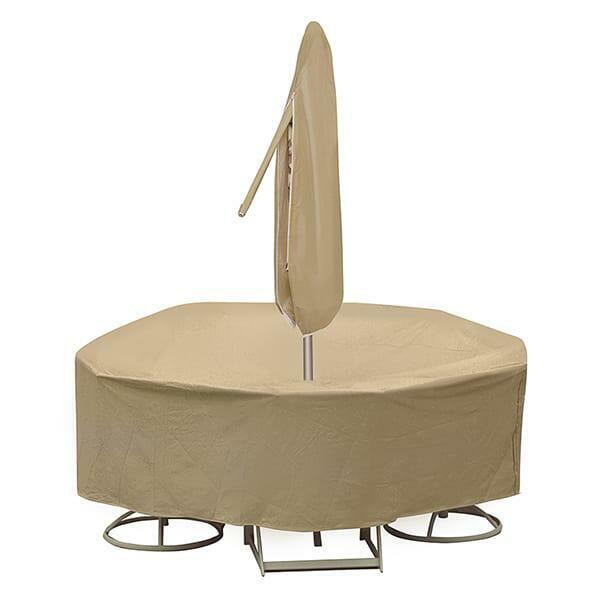 The 60’’ Round Dining Set Cover is made to cover a 60’’ round dining table and 6 high back chairs. The furniture covers may be slipped on as necessary, like during a night of heavy rainfall or other inclement weather. Then, they may be just as easily removed to reveal your ready-to-use, pristinely clean outdoor dining set. Enjoy the exclusive Dura-Gard HD Vinyl creation by Protective Covers Incorporated!